Has there ever been a more beautiful new baby gift? The Bavarian Elector Ferdinand Maria was so delighted at the birth of a much longed-for heir to his throne that he gave his wife Adelaide von Savoyen a piece of land. That was in 1663, and the Wittelsbach Electress Henriette Adelaide von Savoyen built herself a "borgo de la ninfe", a small summer villa with a garden. This was the predecessor of Nymphenburg Palace. At the start of the 18th century the building was extended on both sides, with residential pavilions connected by galleries being added. The exterior was remodelled in the French style and the modest palace transformed into a large, elegant summer residence. Visiting Nymphenburg Palace today is like taking a walk through a book of Bavarian history. 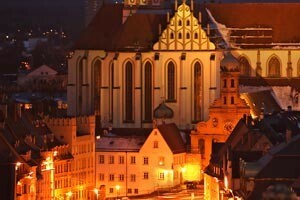 The Kings and Electors of Bavaria left their traces here over a period of almost two hundred years. The first heated indoor pool of the modern age and the silver-blue Amalienburg hunting lodge from the rococo period are elements of a perfect baroque palace and offer an extravagant yet delicate richness of detail in a rare splendour. In the north wing of Nymphenburg Palace is the Museum of Man and Nature, which takes you on a journey back in time through the history of the Earth and mankind. Nearby attractions: Hofgarten Park Munich is one of the largest Renaissance gardens north of the Alps. In the north-east of the garden, there is a path that takes visitors straight to the English Garden. To the north of Munich, Lustheim House in the grounds of Schleissheim Palace contains a famous collection of historical Meissen porcelain. South of Munich is Am Schachen House, which was used by King Ludwig II as a private retreat during his stays in the mountains. A botanical Alpine garden was laid out in front of the house in 1900.